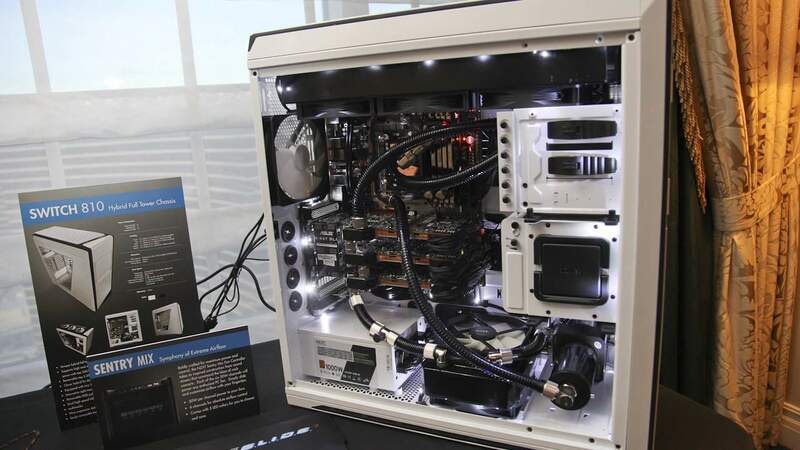 CES 2011 Video Coverage - Zalman Unveils New Products Including Cases, Coolers, SSDs and Monitors...Oh My! Futurelooks has been following NZXT for a very long time. Ever since interviewed the company's front man, Johnny Hou, we realized just how hard it was for a fledgling company to do what they wanted to do and have people accept it. Now that the company is a little mature, Johnny and his team are finally getting the opportunity to create the things they've wanted to create from the very beginning. The first was the Phantom. And now NZXT has a new flagship case called the Switch 810. With some help from NZXT in Las Vegas, we've put together this look at this new case and more in full 1080p HD or you can catch it directly on YouTube. The Phantom is the case that really put NZXT into the race for mindshare. Its sports car like physique and curves made it a favourite amongst enthusiasts immediately. NZXT then came out with a more refined mid-tower edition called the Phantom 410 and it was also a hit at a crazy $99.99 US price point. Recently, they had a shout out to their social media network for suggestions on new colors. Three colors were chosen from that exercise and we now have a new White with Blue Trim, Black with Orange Trim, and a Black with White Trim version. The best part is that they'll still cost the same at $99.99 and now you'll have more colors to choose from for your next build. Moving on, NZXT also wanted to make sure that you were aware of how great their HALE90 and HALE82 power supplies were. But it wasn't totally about the build quality, finish, efficiency or the modular construction. NZXT wanted to make sure you were aware of their industry leading cross-shipping warranty. As mentioned in the video, if your PSU were to somehow "bust a cap", just call up NZXT and they will ship a replacement PSU to you first so that you can get up and running again fast. This is good for three years from date of purchase and I have to admit, even I totally missed this crucial differentiating feature since we all obsess over specifications and build quality. Good on them! At CES 2012, NZXT released the next case that will solidify their position as a company that builds great looking and functional cases at a really affordable price. The new Switch 810 is a massive full tower chassis that has a design that is known as a hybrid. The hybrid part is related to the cooling and configuration options in this new case. Shin Feng, the man behind this new chassis, told us that the hybrid design was a way to allow people to configure cooling and noise the way they want. It employs elements of silent cases (like the opening and closing top vents) and provides for the ability to have the craziest water cooling system installed, or the largest heatsinks for a more passive cooling design. Or you can use a lot of fans and heatsinks. It's totally up to you. The case uses a good selection of dust filters throughout which are easily removable, dual 120/140 fan support at all fan fittings, and support for massive 360mm radiators up to 90mm tall in a single fan configuration, though it was recommended that a good way to go was a 65mm tall radiator with dual fans for a push pull configuration. You'll of course get USB 3.0 support, pivoting internal cooling fans, modular drive bays, even a card reader as standard equipment. But I think the best part is the price. It's only $169.99 US and it's built way to good for that price. That's just how NZXT rolls and this case actually hits the market today. We've got more pics in the gallery below and we'll be doing one of our awesome video overviews of this case very soon! Check out our complete listing of CES 2012 Las Vegas Articles and Coverage Right Here!